We had 8 total participants including myself (Stan joined in just a bit after the start). Temps were cool enough with a fresh layer of snow to provide traction for our climbs and cushion for our descents! Stan provided some history regarding the trail and we managed to stay mostly upright and on course! A big thanks to everyone who attended and contributing to the fun that makes a group ski so awesome. Attached are some photos usually taken during a rest after a good climb. Also attached is mileage of our route minus the first couple of miles (forgot to start the app). 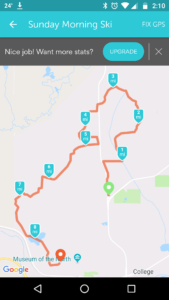 It should give you a good idea of where the trail goes. 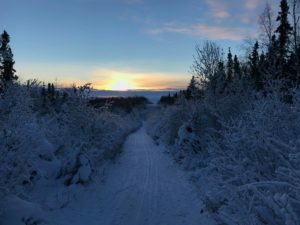 Know that the Skarland Trail is alive and in great shape. Feel free to contact me if wanting to try it on your own and in need of some directions. I think everyone who skied today would agree it is a tour that is well worth your time! 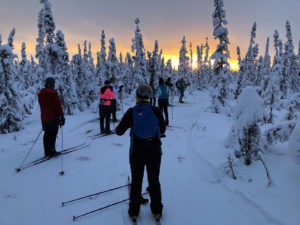 Ski the Skiathon to Raise Money for UAF Ski Trails! 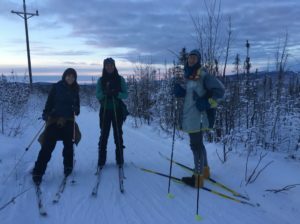 The Skiathon happens on Sunday, March 10! 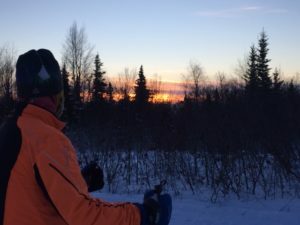 Come on out for this fun classic race/tour of the University of Alaska Fairbanks ski trails! The original Skiathon followed the Skarland 12 mile trail and was THE big ski event of the spring from 1967 to 1977. Once subdivision roads went in, it became too difficult to shovel snow for road crossings. 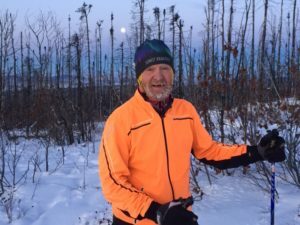 In 2002, Susan Todd and Stan Justice revived the event but eliminated all the road crossings by using almost all the UAF ski trails. Skiers use classic diagonal stride technique (no skating). There is a wood ski division. All profits go to support the UAF trail system, so come have fun while raising money for the UAF trails. Finishers receive a Skiathon Patch. 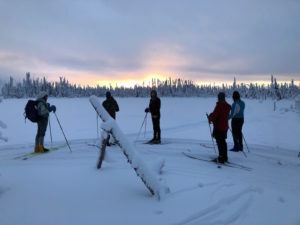 Short description: Complete Skarland loop 12-mile classic ski tour. 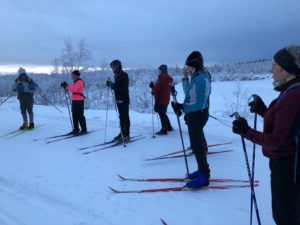 A fun moderate ski tour requiring intermediate to advanced classic ski ability. 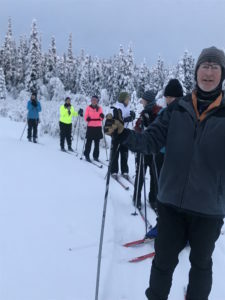 Starting at the UAF Ski Hut we’ll head past Ballaine Lake to connect to the Pearl Creek trail system. 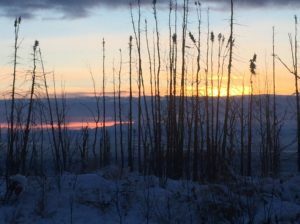 From there we’ll climb up and around the hills above Ballaine Road, following the Equinox trail system back to UAF via the Musk Ox Farm. 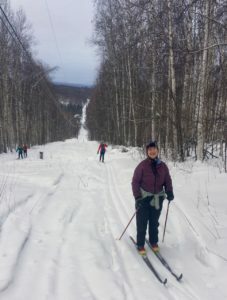 Expect moderate climbs and descents, hopefully on groomed tracked trails. There will be several road crossings. 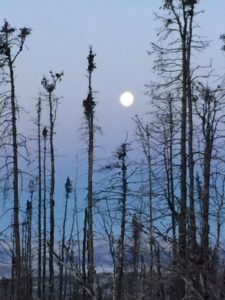 Be prepared for variable waxing temperatures and bring sufficient water and snacks. No dogs please. 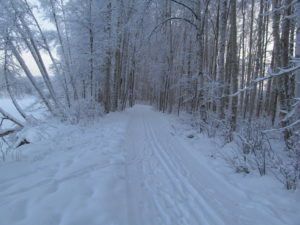 We’ll be skiing on groomed trails, through residential areas, and crossing roads. 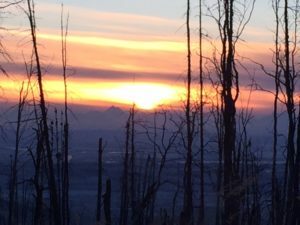 Below are photos from the Summit to Old FE Co via Margaret’s Corner Tour held February 16 and led by Philip Marshall. 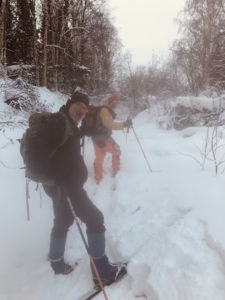 Mike Schmoker and Margaret Mannix accompanied Phil on this snowy tour. Photos courtesy of Mike Schmoker. 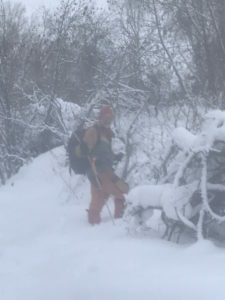 Tour report from Phil: Deep snow; slow going. Fine temps. 3 hours. Dog loved it. Start time and place: Meet at Cleary-Summit’s Skiland Road parking lot with the DOTPF videocam just off the Steese at 10:30 AM. 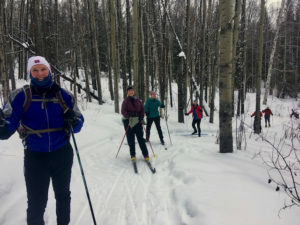 Carpool to old FE Co at Chatanika to place cars at tour’s end, then drive back to ski start at ridge above Cleary-Steese Col.
Short description: Advanced-level backcountry ski with variable terrain and some steep, long downhills and tight turns (most can be traversed or walked); skins advisable, if have. Usually on old narrow road that may or may not be broken out. Beautiful forest to historic Davidson Ditch via steep trapper’s trail. 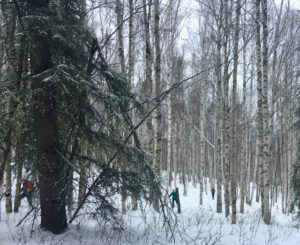 Descent from Margaret’s Corner is steep and ungroomed through black spruce. We may cut Mongolian skipole brakes to assist descent and extraction. Finish across from old FE Co, but not before overflow at base of Lulu Creek and crossing the tailings on a new end to this tour. Can be cold down in this valley. Bring shovel to dig parking spots along roads. Also have food and drink. K-9s welcome. No temperature cut-off. Leader: PS Marshall (457-3895 or @ Cleary 389-2449; <pmarshall@acetekk.com>). These photos of the December 30 Rat Ponds Tour took a winding path (kind of like the tour! ), but they finally got the right place. Thanks to Brooks Ludwig for the photos! 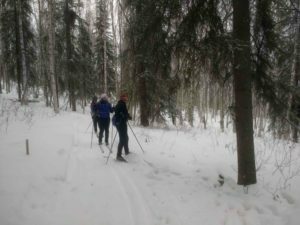 The ski tour at the groomed River Park Ski Trails in the Chena River Recreation Area scheduled for this Saturday, January 12, has been cancelled. (Tour described below.) 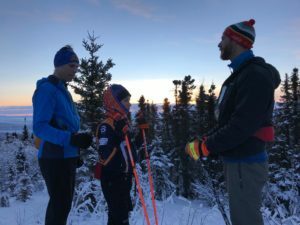 Frigid temperatures and snow is forecast, making for a double whammy: Too cold to ski and too cold for the borough to groom the trails if it snows. Tour leader Lisa Stuby will try to reschedule for a later and warmer date. 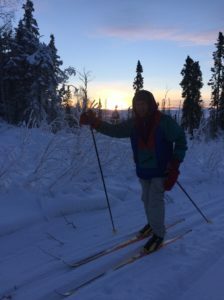 Description: Ring in the new year and ski the groomed classical ski trails that are nestled along the Chena River and the flood control collection channel. The trail system is flat with no hills, we just have to watch out for moose. 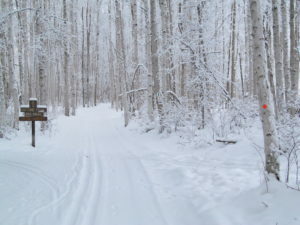 While on the trails, for those of you doing the Fairbanks Winter Trails Challenge, we’ll also be looking for “The Sign”! 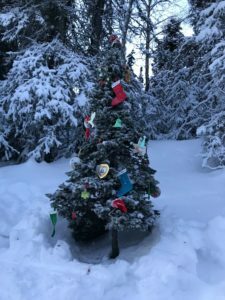 To get there, from North Pole follow Laurance Road to enter Chena Lake Recreation Area. Near the end of the road, turn left onto the River Park Road. Parking is at the pavilion on the left. 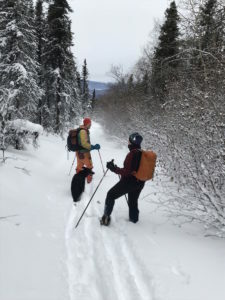 Per the CLRA Winter Guide, no dogs are allowed on the ski trails. Tour will be cancelled if temperature is -15F or lower at the airport (NWS website). Here’s report of the December 30 Rat Ponds Tour from leader Stan Justice. Photos by Margaret Mannix. Tour description by Stan (link at bottom of post). Report: 11 of us started the tour and all 11 made it back. Temp was just above zero. Very nice sun rise followed by a nice sunset. Took us about 2 hours and someone’s smart phone told them it was 6.8 miles. 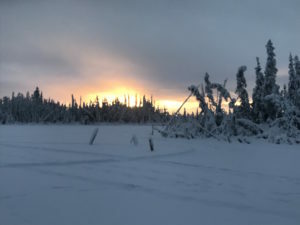 Description: The tour uses parts of the mushing trails to access trails around Rat Ponds (aka Caribou Lakes although there are many more muskrats than caribou). 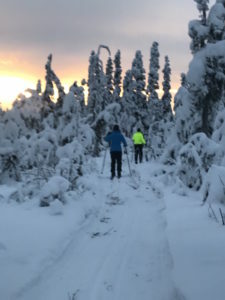 Terrain is flat with a few short steep hills that can be walked. With luck we will have set classic tracks.